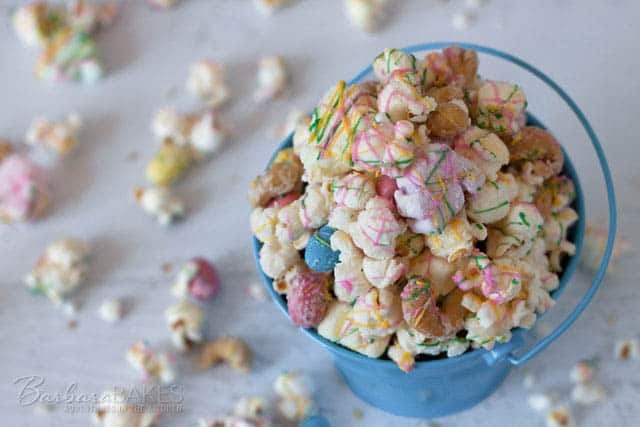 Easter Rocky Road Popcorn loaded with cute, colorful bunny marshmallows, chocolaty mini Robin Eggs, and salty cashew nuts. How could I resist an offer like that? 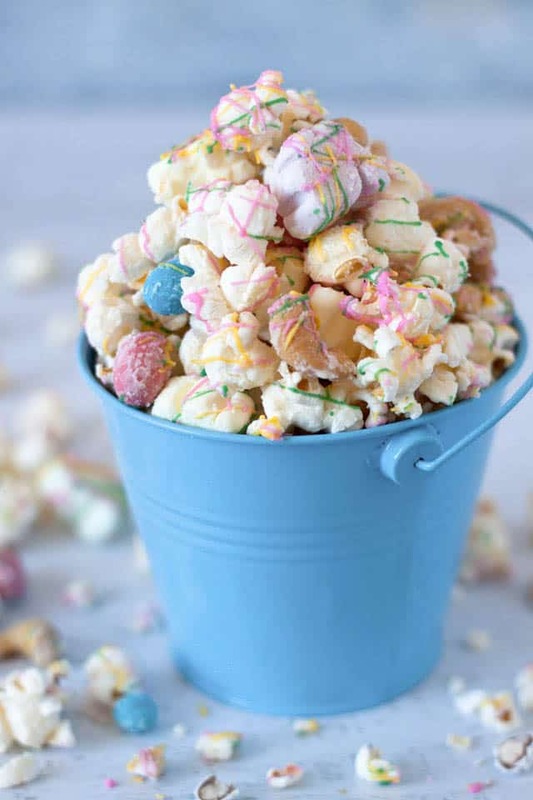 So my little helper and I whipped up this easy-to-make Easter Rocky Road Popcorn. 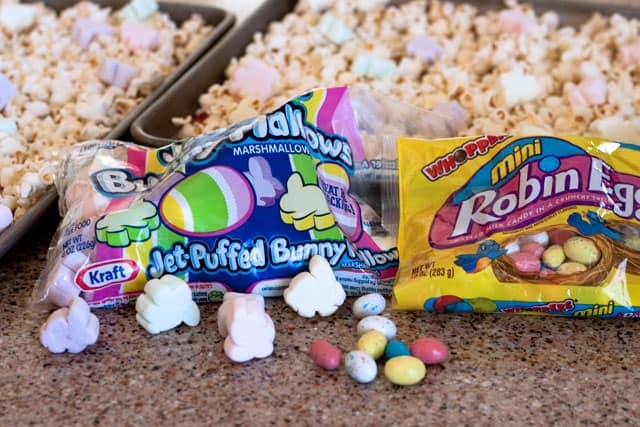 He loved taste testing the bunny marshmallows, Easter candy and nuts while we were adding them to the popcorn. He also had fun drizzling the colorful candy melts on top. The bunny marshmallows I bought at Harmons, a local grocery store. They were stocked in the Easter candy section. I’ve also had good luck finding specialty marshmallows at Walmart and Target super stores. You could substitute mini colored or regular marshmallows, but only use 1 cup. Robin Eggs are one of my and my husband’s favorite Easter candy, but you could substitute any chocolate Easter eggs you prefer. My daughter isn’t a fan of malted milk balls, but she liked the mini Robin Eggs in this popcorn. In fact, she loved this popcorn so much she took home the recipe and made another batch a few days later. My aunt stopped by after my daughter left. She brought me an old cookie sheet for my food photography (thanks auntie!). I sent her home with some Easter Rocky Road Popcorn as a thank you. Later she messaged me and told me how much she loved it, and asked for the recipe. It’s a craveable, can’t stop eating it popcorn. You need to make it asap. I’m sure you’ll love it too. Pour the popped corn onto 2 baking sheets lined with a silpat or parchment paper. Remove any unpopped kernels. 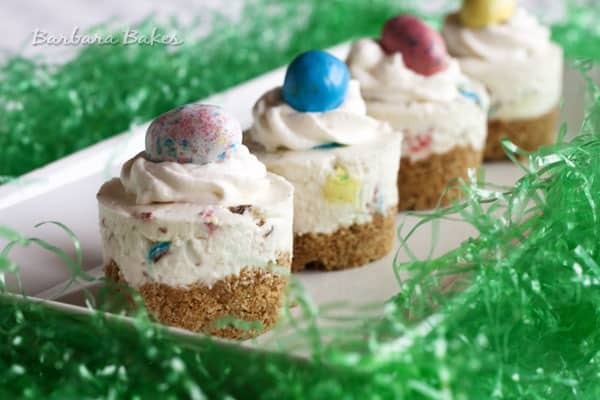 Mix in marshmallows, Robin Eggs, and nuts. In a microwave-safe bowl, melt white candy melts on 50% power. Drizzle melted evenly over the popcorn. 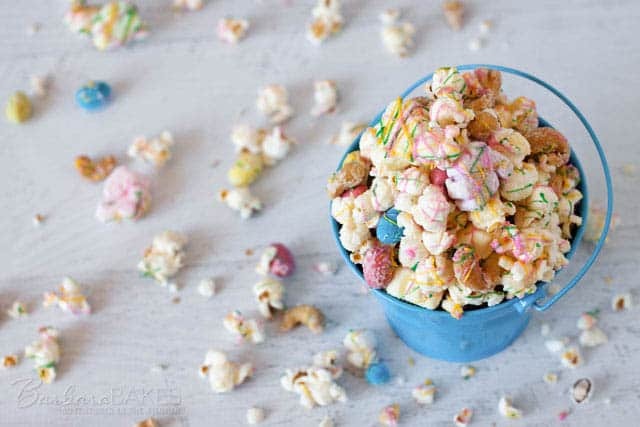 Using a spatula, toss the popcorn mixture to coat it with melted candy. Put colored candy melts in three Ziploc bags, microwave candy melts at 50% power for 1 minute. Knead candy in the bag. Continue to microwave and knead at 30-second intervals until smooth and completely melted. 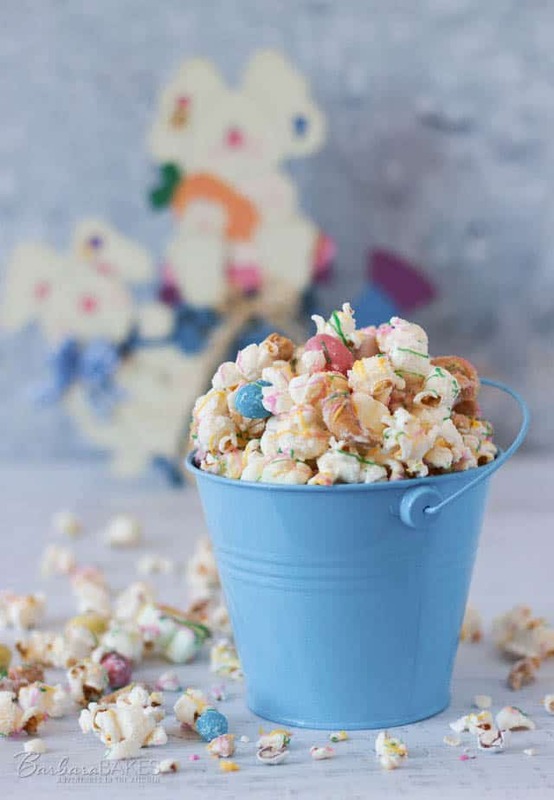 Snip off a small corner of the Ziploc bags and drizzle the melted candy on top of the popcorn. Let the popcorn rest on the baking sheets until the melted candy is dry. Nutella Cream Eggs, Inside BruCrew Life. How fun it was to see your post, hadn’t noticed before. Thank you! The popcorn looks lovely. So cute for kids of all ages. Such a fun Easter treat. I love your other fun Easter recipes also. Bookmarked! Oh BOY! This looks like such a delicious snack Barbara! YUM! What a FUN post and idea. That is soooooooo Easter and what alternative to sugar laden Easter basket stuff. Plus it’s soooo dang fun. FUN! And so pretty with all those pastel colors. I can see why that would be addictive with the mix in there. Robin is still talking about your candy corn popcorn and how much she and her family loved that. 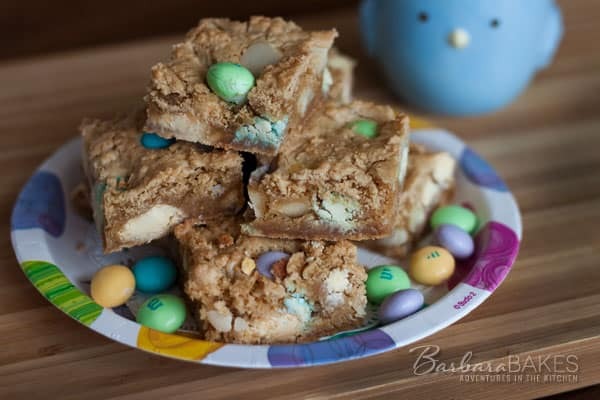 I saw the marshmallow bunnies at Target last week…will have to pop over and grab a bag with some Robin’s eggs…..and will look for the pastel melts too. If I can’t find them I have white ones galore. This would be a Easter treat for sure.